I have been a long term fan of Lily Lolo’s loose mineral range, but I thought it was high time I explored some of the pressed mineral products that they are releasing. Pressed minerals without talc aren’t the easiest to come by, especially if you are on a budget, so I was keen to see what the pigmentation and feel was like. 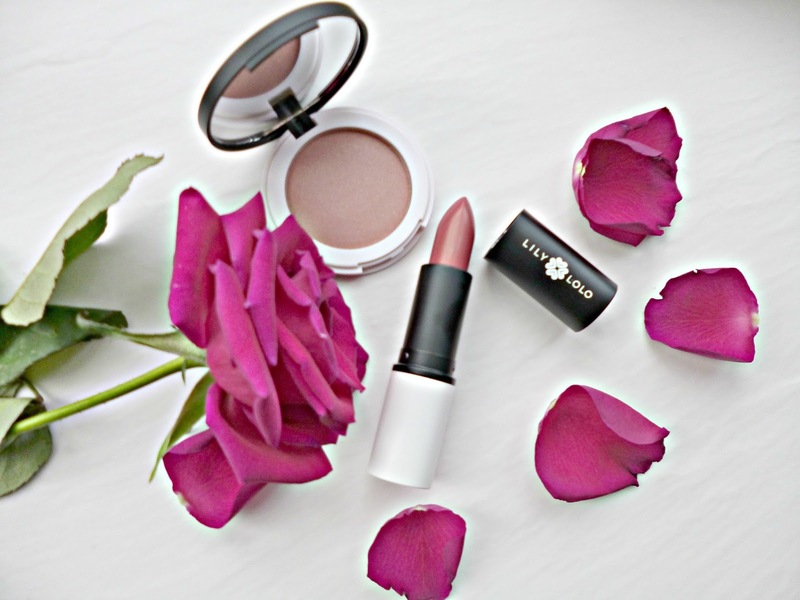 As a fan of a classic pink I was drawn to one of the pressed blushes and lipsticks for a pretty everyday look. The Pressed blush (£11 for 4 grams) in the shade tickled pink is a very light peachy pink with a touch of gold shimmer. This blush would be good for very fair skin tones as it isn’t overly pigmented, on darker tones I think it could be used a highlight as it does give a very pretty sheen. In terms of formulation, aside from the pigmentation I was very impressed with the fact that this applies very nicely without a lot of fallout and feels creamy. In older reviews of pressed products from the brand, quite a few bloggers mention a strong scent to the product, this appears to be resolved as I couldn’t detect anything at all on application. Given the reasonable price these blushes have a lovely selection of oils added including argan oil and pomegranate oil. I will be interested to see the pigmentation of some of the other shades as well, you have a selection of matte and sheen finishes to choose from. Something I would really like to see happen would be for Lily Lolo to make the compact refillable or at least offer the chance to get just the pan to pop in a palette, because currently the rather lovely plastic casing will be headed for the recycling bin which is a shame. The Lipstick (£9.50) Is one of the most reasonably priced lipsticks I have tried, I have the shade Romantic Rose a mid toned pink. The lipstick has a lovely creamy feel, probably thanks to the mix of oils but it makes it a very comfortable everyday lipstick no need for lip balm first with this one. I hadn’t looked at Lily Lolo’s lipsticks in a while but I was impressed to see that there are thirteen shades in total. My main problem, like a lot of make up companies is that the online swatches aren’t really all that good, I failed miserably at doing swatches for this post however, I will try and pop one up when I get some favourable lighting so you can see the colour on as it really rather pretty. If you are searching for affordable mineral make up without any of the nasty fillers, Lily Lolo is a favourite for me. Buav approved, Bismuth Oxychloride and talc free, it ticks a lot of boxes. Some of the products in the range are vegan however check individual ingredients listings because these do have carmine and the lipstick also contains lanolin and beeswax. I am really happy with these products and reach for them often. Have you tried Lily Lolo? What are your favourites?